A postcard showing the gates to the former women's prison in Cummings Valley. A field of sugar beets being raised for seed in the eastern Tehachapi Valley. The south side of Tehachapi City Park. The Keene Store as it looked in the early 1970s. The Tehachapi Veterans Hall on F Street hasn't changed all that much since this postcard was made in the late 1940s. A 1919 postcard of the Tehachapi Loop. Over the years I have found a handful of postcards featuring the Tehachapi area. These old souvenirs offer a snapshot in time of the Tehachapi Mountains. The first American postcard to be printed as a souvenir was created in 1893 to advertise the World's Columbian Exposition in Chicago. Initially, only the U.S. Postal Service was allowed to print postcards, but this monopoly ended in 1898. Once private publishers and printers were allowed to create their own postcards, the industry grew exponentially and there were soon thousands upon thousands of different picture postcards that Americans could buy and send for just a penny stamp. The so-called "Golden Age of American Postcards" is generally considered to begin in 1898 and continue through 1915, when World War I disrupted many peacetime activities, like printing and sending postcards. It was in 1907 that postcards were allowed to have a divided back, typically with the right half reserved for the stamp and address, and the left side for a message from the sender. This configuration continues more than 100 years later. The oldest Tehachapi postcard that I have is an image of the Tehachapi Loop, mailed from Fresno on May 19, 1919, from someone who had rode a train around the Loop, to a man named Paul in Cleveland, Ohio. The inscription starts by saying "The track around this hill to make grade did look strange to go clear around it." I have some later postcards from the 1970s of a train emerging from a tunnel that is part of the Loop. When I was growing up, this was one of the few Tehachapi postcards that were available. There was a small series of Tehachapi postcards created in the late 1940s using photos taken by a man named Max Mahan and published by the Columbia Wholesale Supply in Hollywood. These included a view of the attractive front gates to the women's prison in Cummings Valley, which was heavily damaged in the 1952 earthquake and later rebuilt as the California Correctional Institution, a men's prison. Another of the Mahan images shows sugar beets being grown for seed out near Monolith. The mountain at the quarry site, now owned by Lehigh Southwest, was considerably larger then than it is today. At one time in the early 1950s, it was estimated that 90 percent of America's sugar beet seed was grown in the Tehachapi area. There is another image of D Street along the south side of Tehachapi City Park (now Phil Marx Central Park), back when the road still connected to itself and was known as "the S curves." Another image shows the newly-completed Tehachapi Veterans Hall on F Street. A newer postcard from the 1970s shows the Keene Store, complete with a couple of ugly hatchback cars from the era parked outside. The inscription notes that at that time, the store, restaurant and service station were owned by Ed and Ethel Melton. The study and collection of postcards is known as deltiology, and is allegedly the world's third largest collecting hobby, after philately (stamp collecting) and numismatics (coin collecting). I'm not a postcard collector per se, but I'm interested in practically anything pertaining to Tehachapi, so I'm happy to have these photo souvenirs of our area. 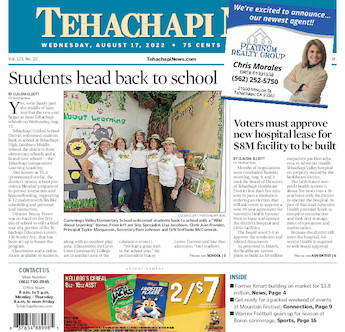 Jon Hammond has written for Tehachapi News for more than 30 years. Send email to tehachapimtnlover@gmail.com.